Surrounded by her loving family, Peggy passed peacefully away on Monday, November 26, 2018, at Western Memorial Hospital. 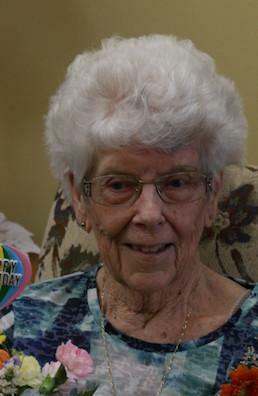 She is survived by her loving children: Taylor (Carolyn), Corner Brook and Donna (Keith) Byrne, Steady Brook; seven special grandchildren: Kelly (Willie), Brian (Tara), Sandra (Craig), Michelle (Andrew), Janice (Corey), Scott (Emily) and Glenn (Ashley); in addition she was enormously blessed with 17 great-grandchildren; Taylor, Liam, Benjamin, Reed, Regan, Chase, Jayden, Carrie, Quinn, Brook, Lola, Izzie, Cash, Axl, Remy, Maida and Kiefer; brothers-in-law George (Mary), Ted (Carolyn), Gilbert Ernest; sisters-in-law: Nellie Brake, Joan Davis, Betty Cotter, Ruth (Darryl) Cook and Kit Colbourne; as well as a large circle of family and friends. Predeceased by the love of her life Gerald (Cobe), brother Laudrick Gillingham, sister Bonnie Ernest, and parents Hubert and Blanche Gillingham. Peggy loved her family, her children, grandchildren and great-grandchildren, they were the joys in her life. The funeral service will be held on Thursday, November 29th at 11 AM from St. Michael and All Angels Church, Park Drive with Reverend Roberta Woodman officiating. Interment to follow at Mt. Patricia Cemetery. Friends may visit Fillatre’s Funeral Home, 4 St. Marks Avenue on Wednesday from 2-4 and 7-9:00 p.m. As expressions of sympathy, in lieu of flowers donations may be made to the Children’s Wish Foundation. The family guest book may be signed by visiting our website www.fillatre.ca.